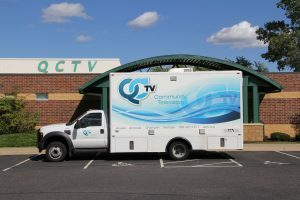 Quad Cities Community Television is a programming entity managed by the Joint Powers Commission – Quad Cities Cable Communications Commission. The commission is comprised of two commissioners from each of our four member cities. QCTV provides information on city government, local sports, and community activities for the northern Twin Cities suburban cities of Andover, Anoka, Champlin, and Ramsey. The video programming and information is presented via local cable channels 15, 16, 18, and 19 on the cable TV system owned and operated by COMCAST. QCTV was able to launch their first HD channel which you can find on 859! Channel 16 is an exclusive government channel for each city we serve and provides cablecasts of local municipal meetings and our signature program – News and Views, featuring city services and activities. In addition, these local channels display an electronic bulletin board containing information regarding council agendas and city events. All four cities receive the same community channel 15 with local programs and channel 18 programmed by the Anoka-Hennepin School District. Informational channel 19 is a community bulletin board that displays upcoming community events.